Damage was caused to school in Sheffield when a car was driven erratically around the school grounds this morning. Police were called to a secondary school in Owler Lane, Sheffield just before 8.25am this morning (Tuesday 13 February), following reports that a black BMW was being driven at speed around the school car park and had caused damage to the entrance. Staff and pupils escaped unharmed but children were sent home while a police investigation into the incident was launched. Two men, aged 23 and 20 and both from Sheffield, have been arrested on suspicion of dangerous driving and causing criminal damage. 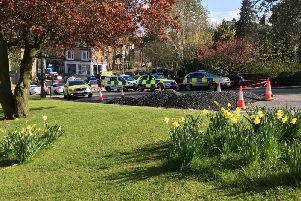 Temporary Detective Chief Inspector Steve Ashmore, said: "The school will remain closed for the remainder of the day as officers conduct enquiries to establish the exact circumstances surrounding the incident and provide reassurance. "We are confident that this is an isolated incident and there is no current risk to the school or the surrounding community."